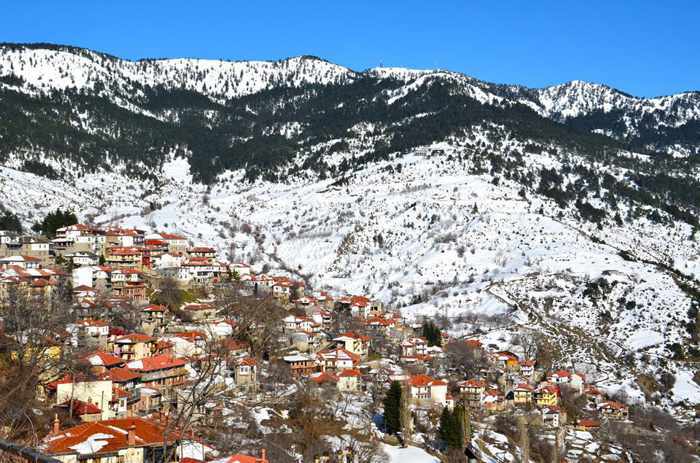 A beautiful sunny day view of the red-roofed houses of Metsovo and the snowy Pindus mountains in the Epirus region of northern Greece. 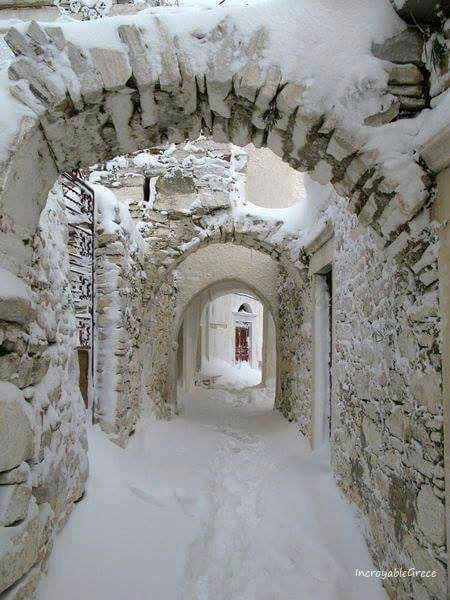 This image appeared on the Visit Greece page on Facebook. 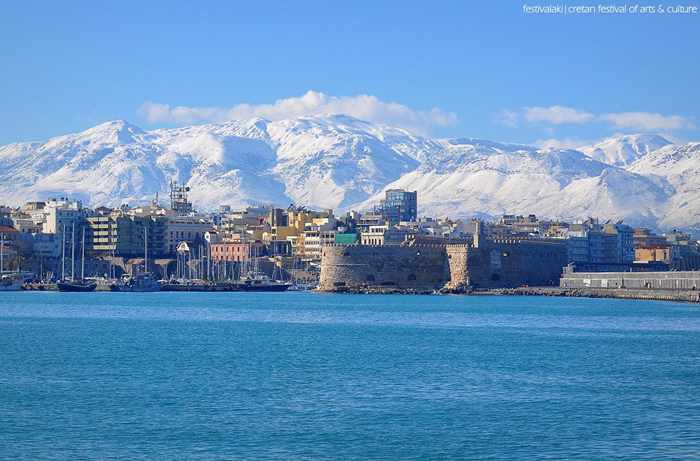 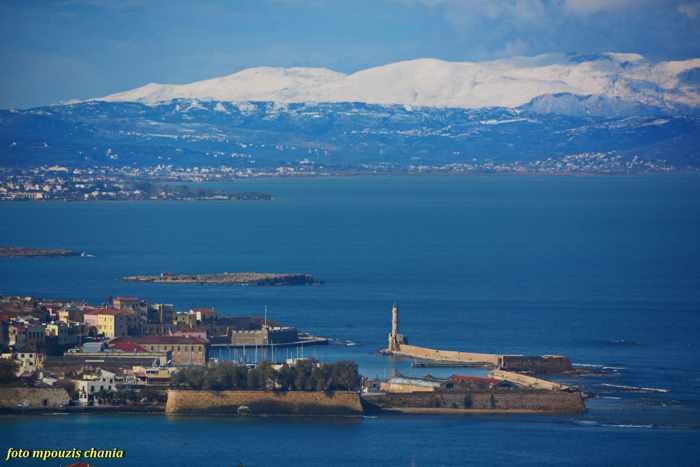 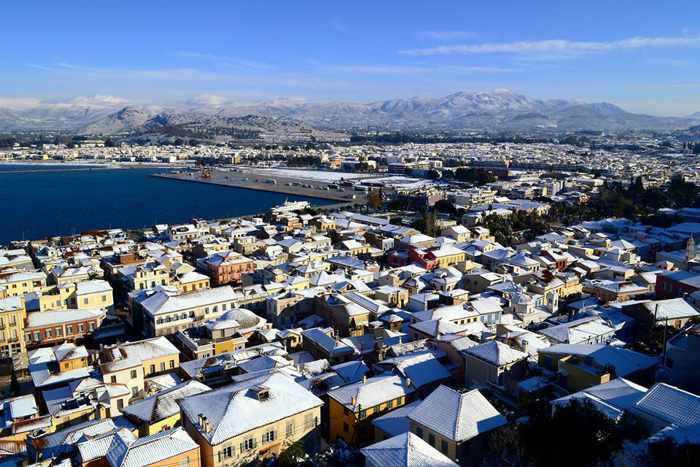 The snowy Psiloritis mountains provide a striking backdrop in this view of the city of Heraklion. 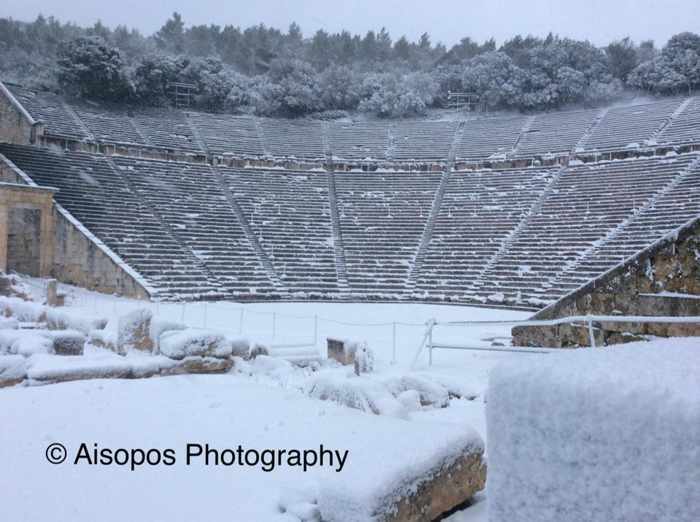 The photo appeared on the Facebook page for Festivalaki: Cretan festival of Arts & Culture, and was credited to Stavros Theologidis. 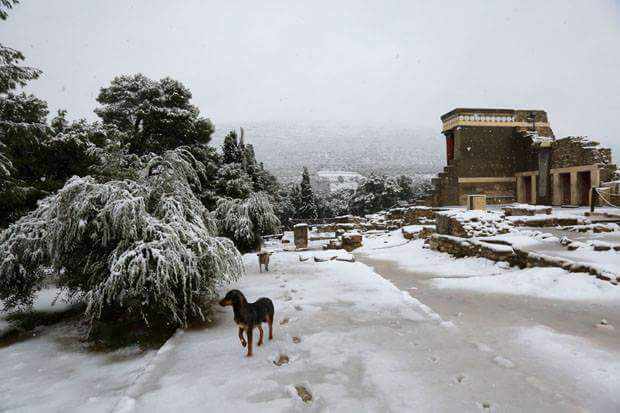 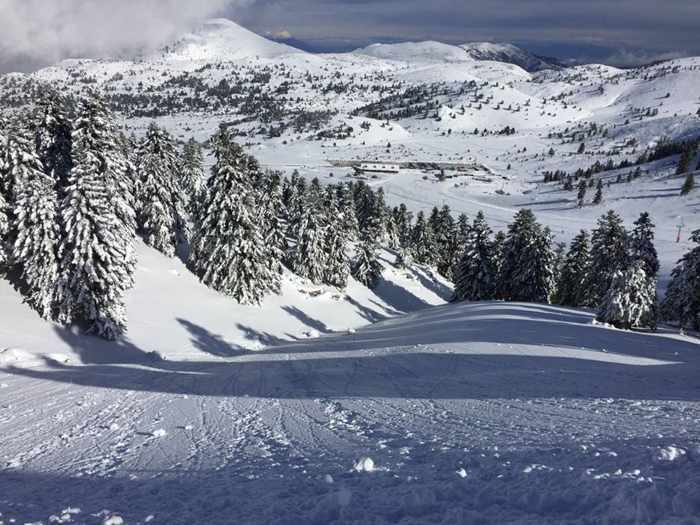 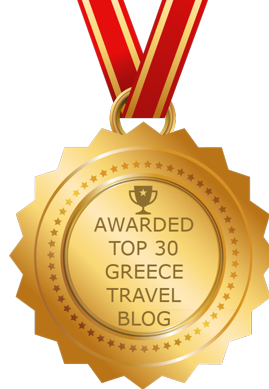 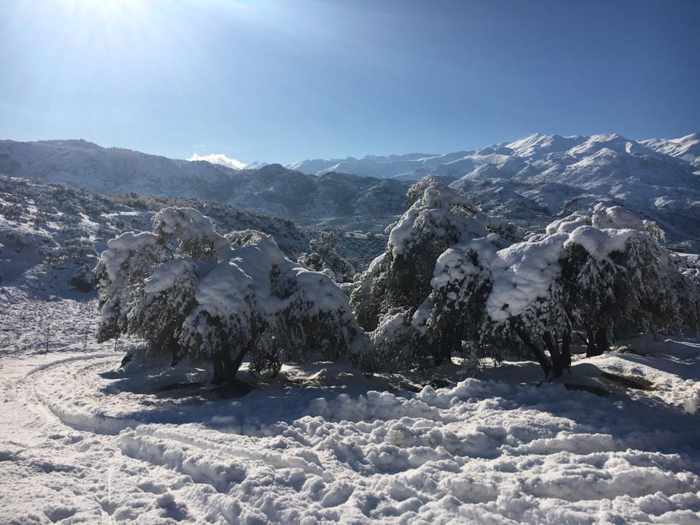 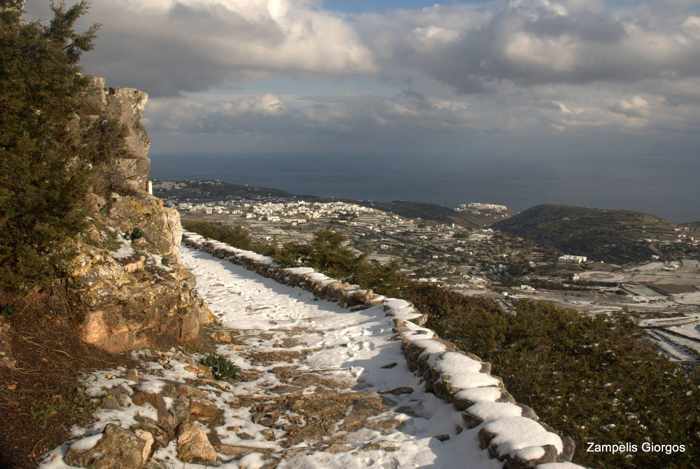 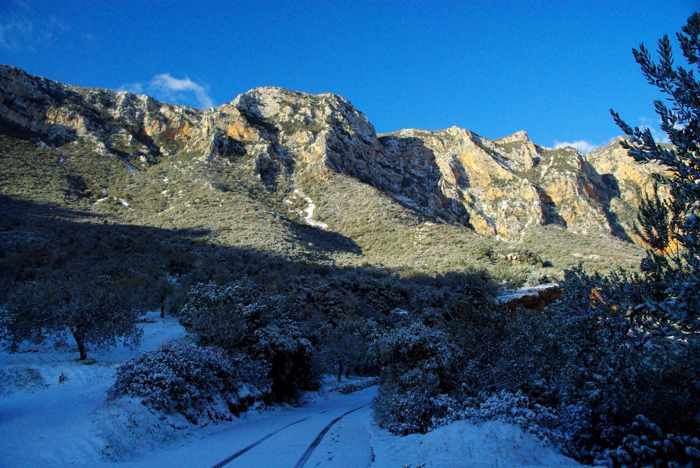 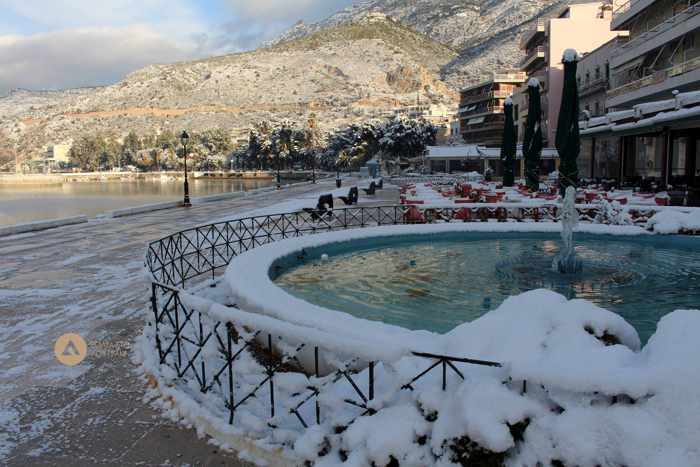 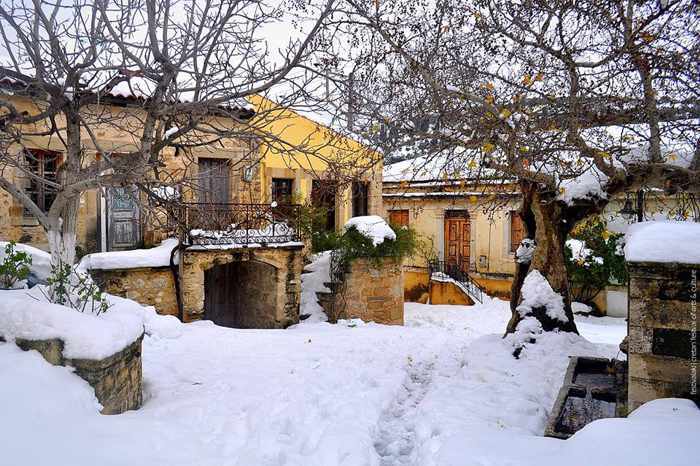 You can view many more winter photos of Crete on the Festivalaki page. 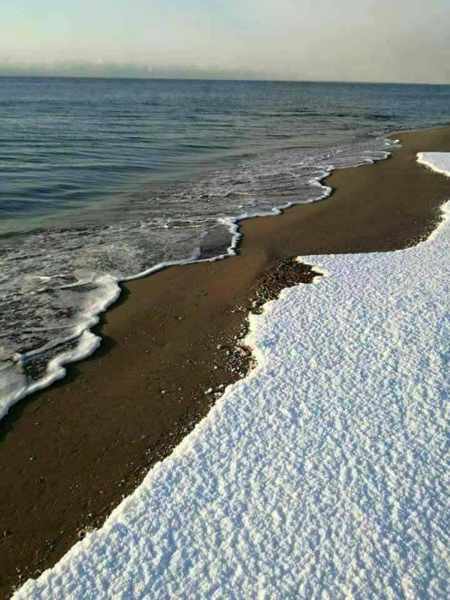 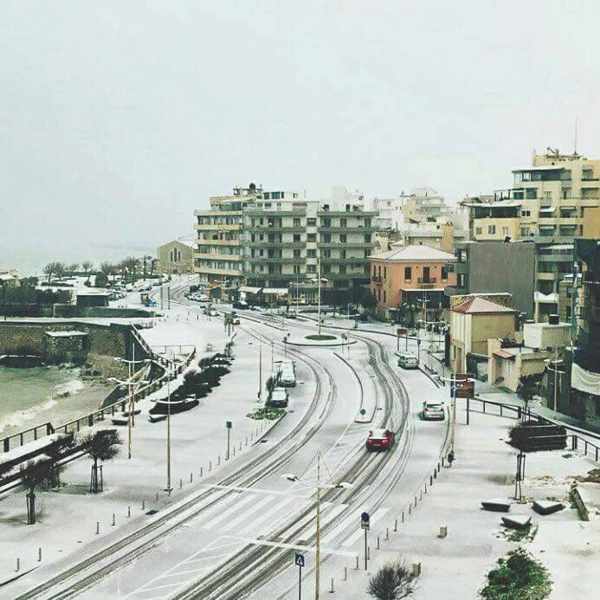 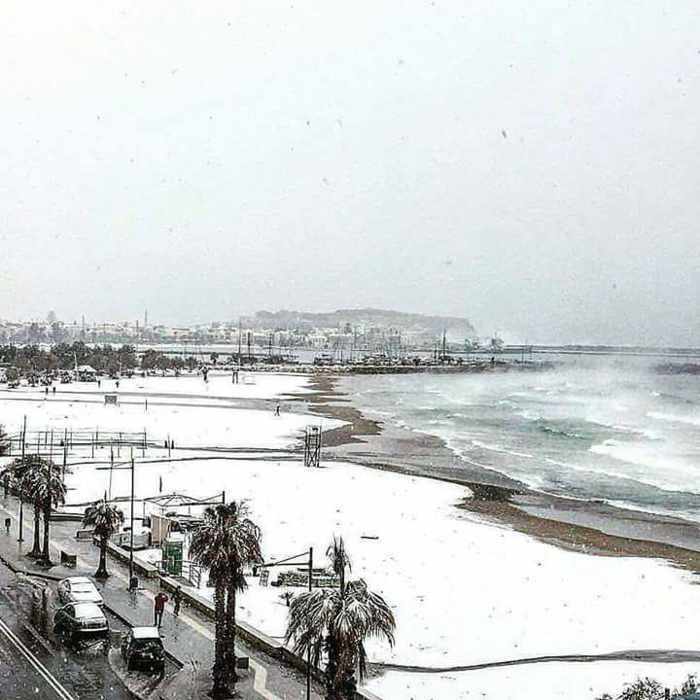 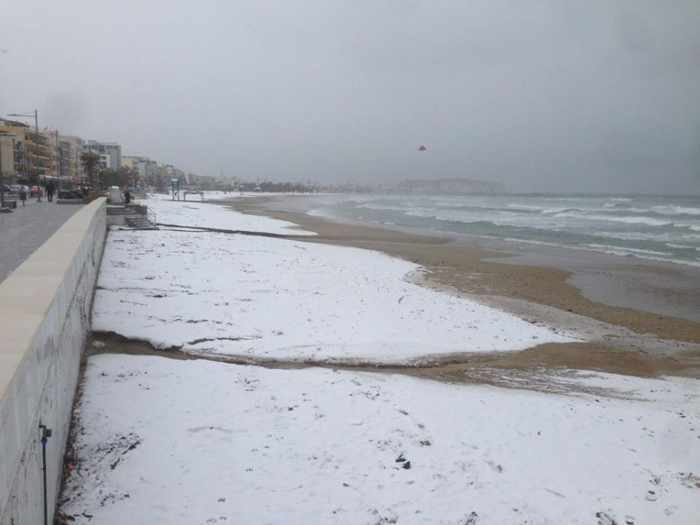 This image of snow on the beach at Rethymno was shared on the Severe Weather Greece page on Facebook, and credited to photographer Νικήτας Κοζυράκης . 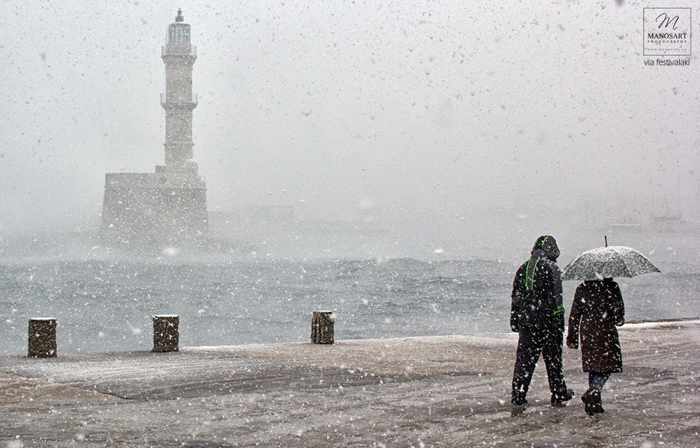 You can find scores of winter storm photos posted on the timeline for the Severe Weather Greece page on Facebook. 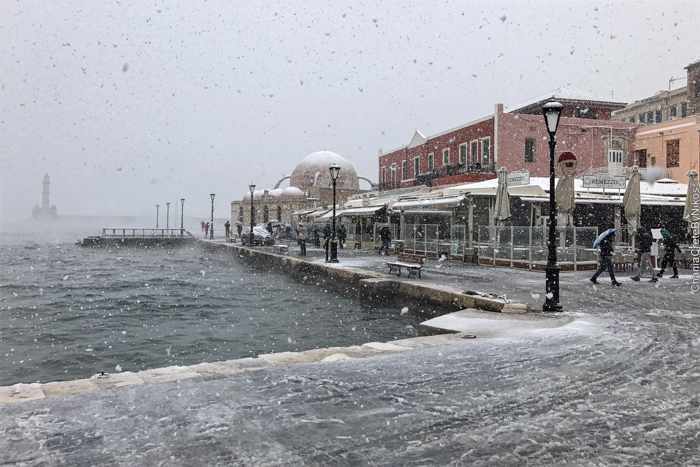 Additional pictures can be found in two special photo galleries on the Severe Weather Greece website– click here to view Part 1, and click here to see the photos in Part 2 of the series. 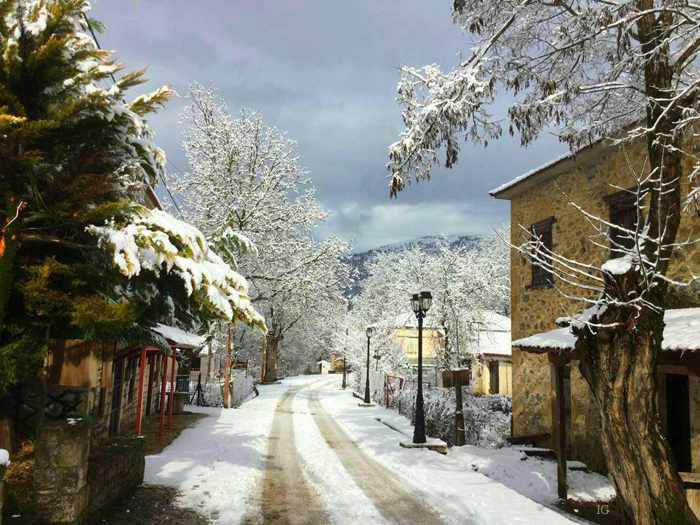 A scene from Asites village on the eastern slopes of the Psiloritis mountains. 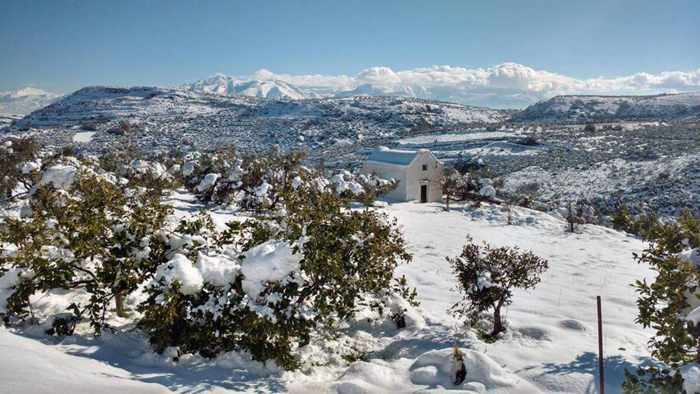 The photo was shared on the Facebook page for Festivalaki: Cretan festival of Arts & Culture, which credited the image to Despoina Kopidaki. 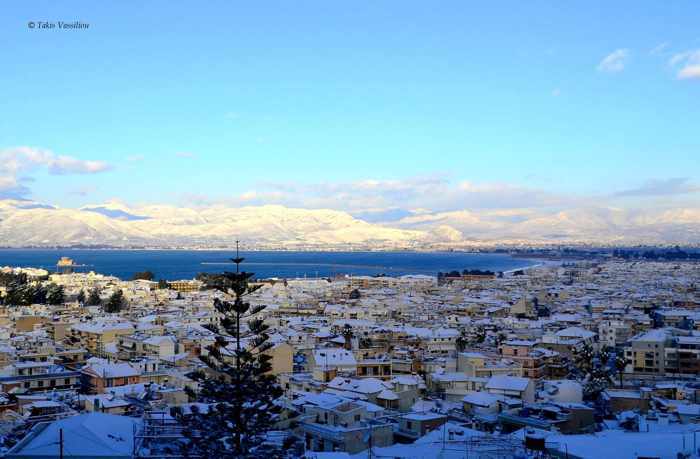 Sea view of Chania and the snowy mountains behind the city. 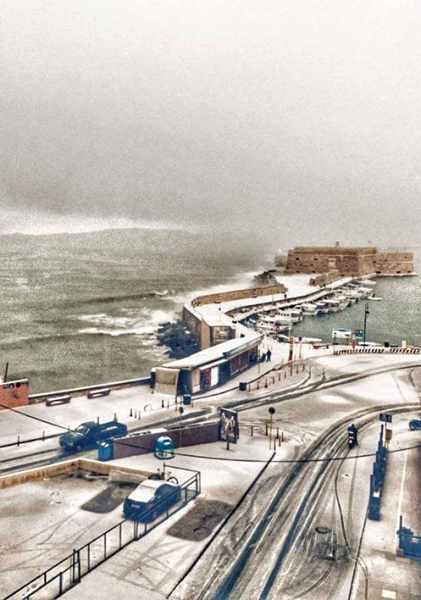 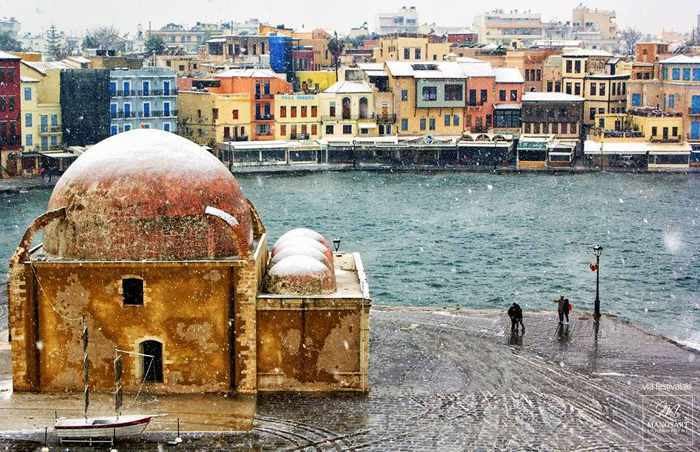 This is one of dozens of winter scenes from Chania that you can view on the Facebook page for Foto mpouzis chania crete. 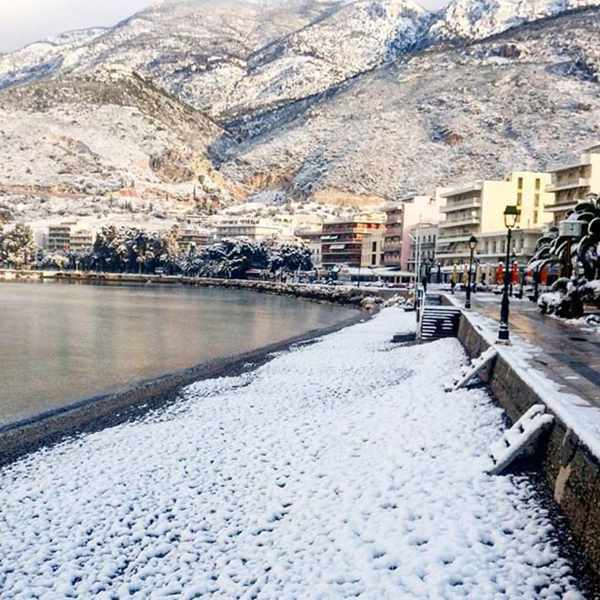 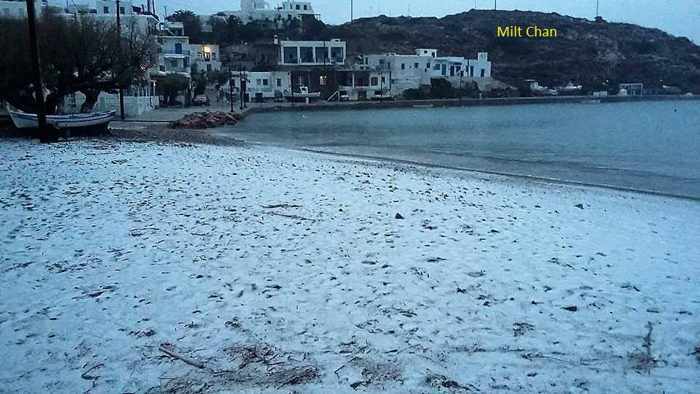 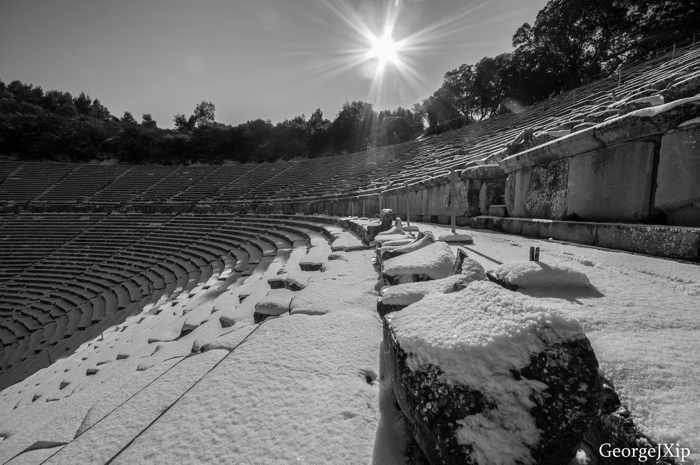 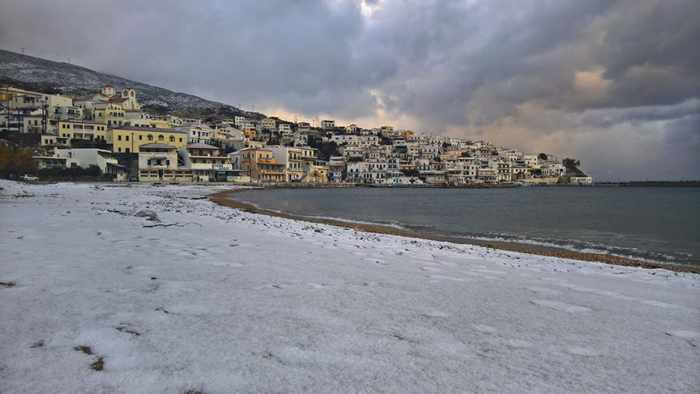 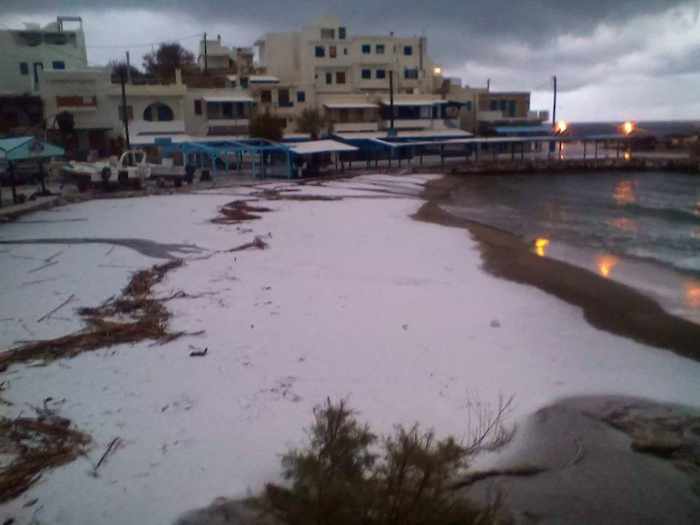 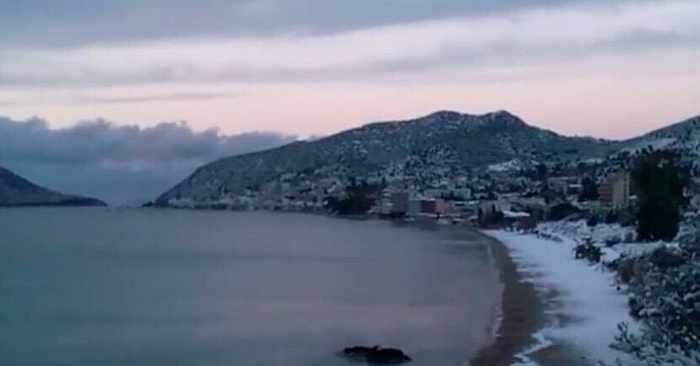 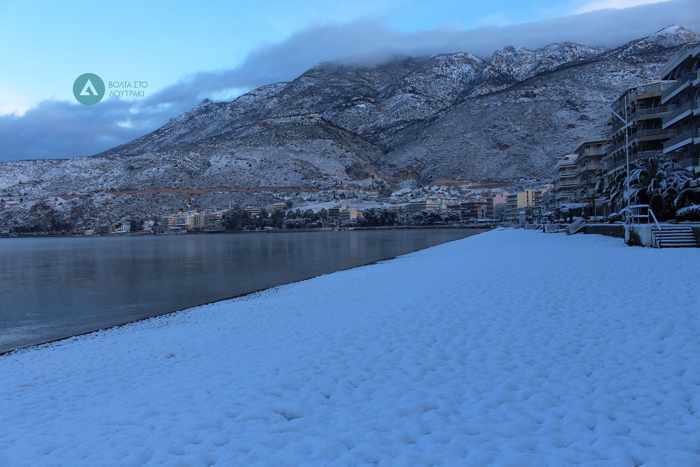 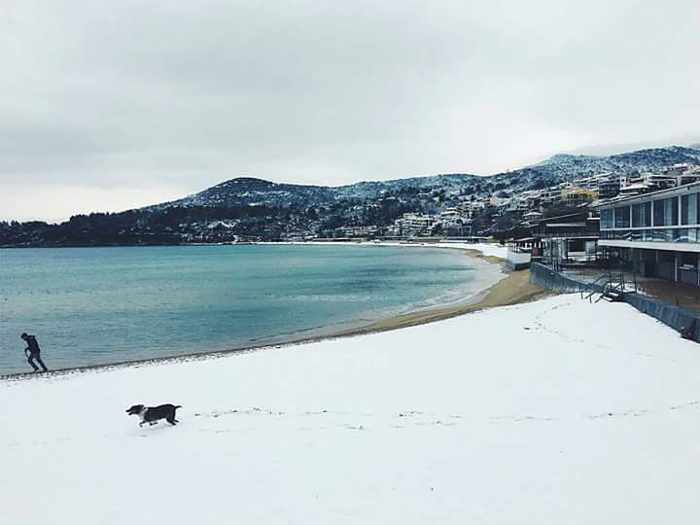 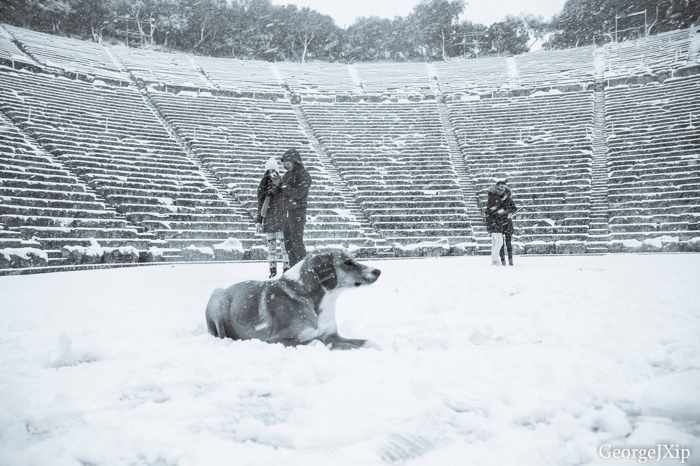 The beach at the popular resort area of Malia is seen dusted with snow in this Nikos Katsoulis photo shared on the Festivalaki: Cretan festival of Arts & Culture page on Facebook. 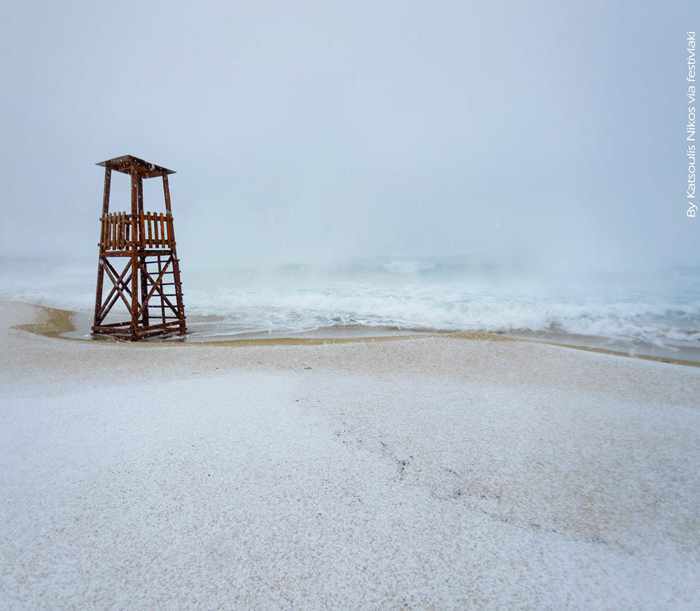 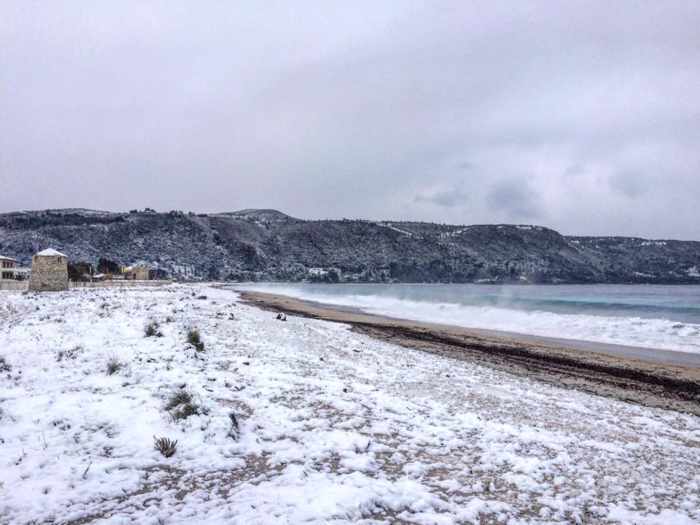 The sea at Myrtos beach on Kefalonia appears to be steaming like a cauldron, in this image from a gallery of winter snow photos on the inkefalonia news and entertainment website. 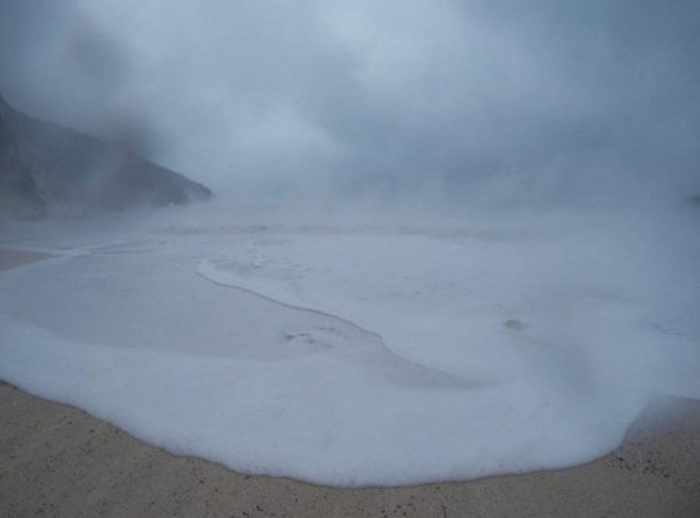 The “boiling water” illusion is a rare phenomenon that occurred when a mass of cold air encountered the warmer water below. 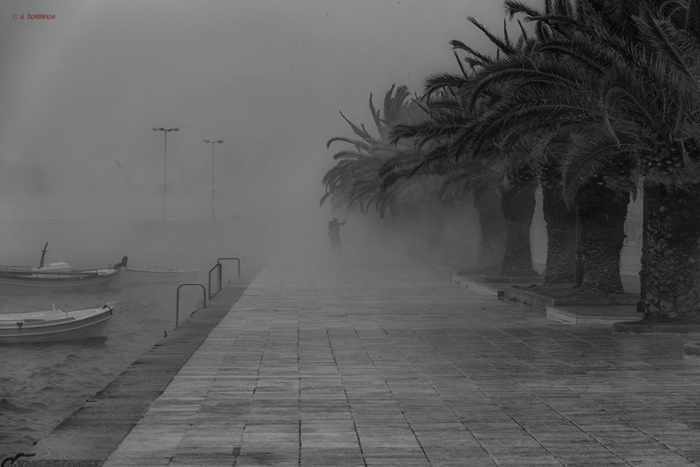 The 20-degree Celsius temperature difference caused condensation to fill the air, creating the somewhat spooky steam effect. 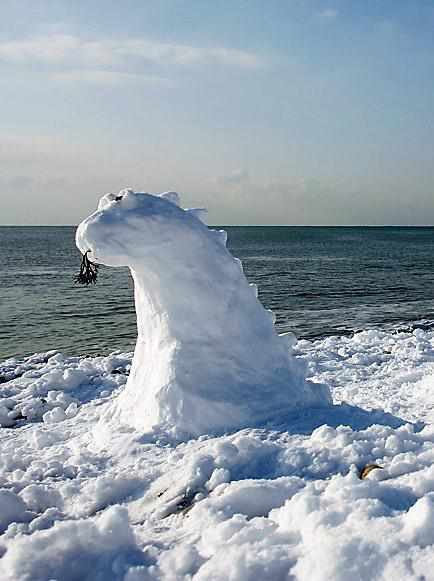 It must have been an incredible sight to witness in person. 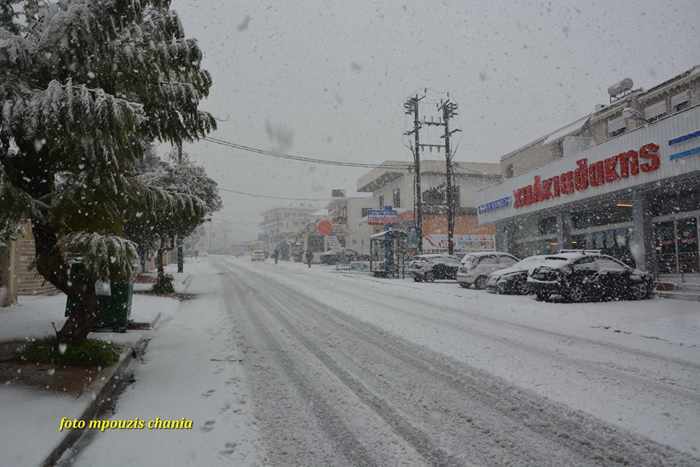 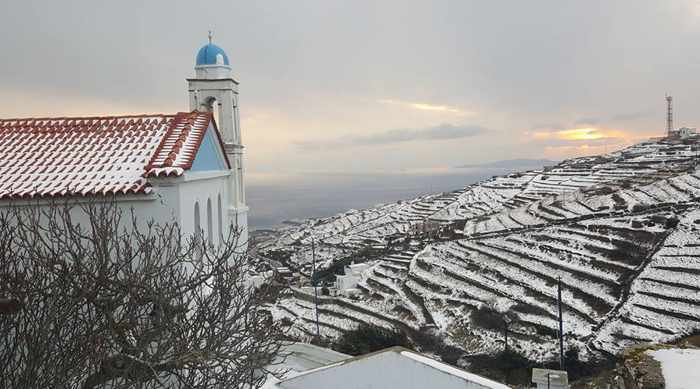 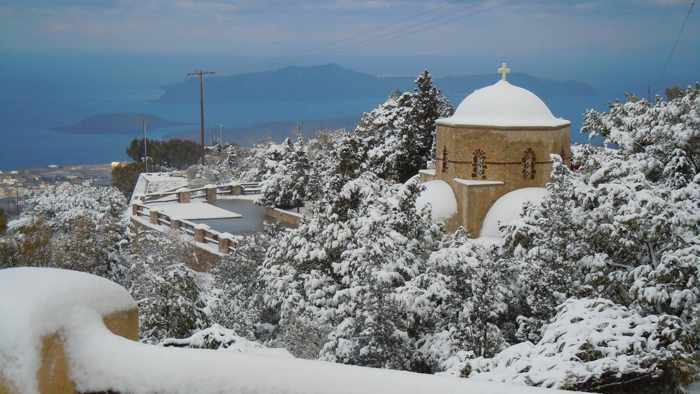 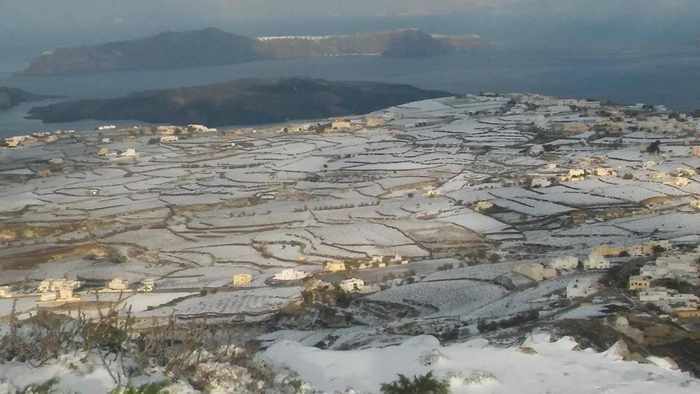 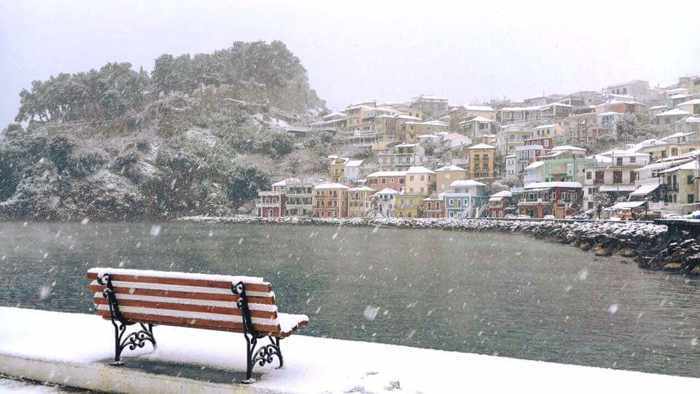 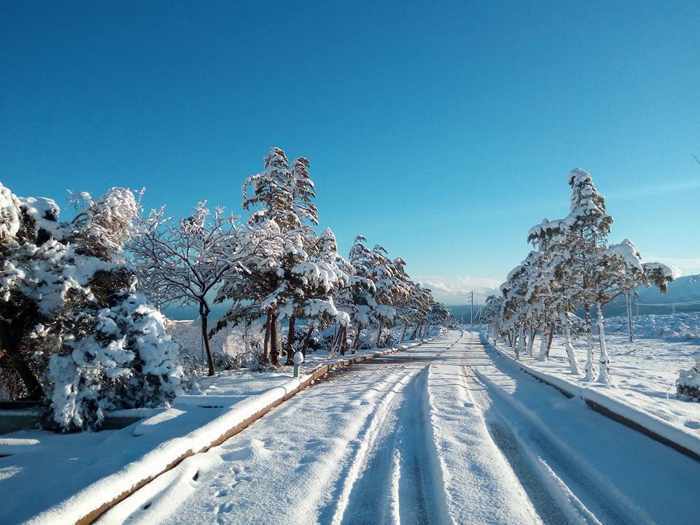 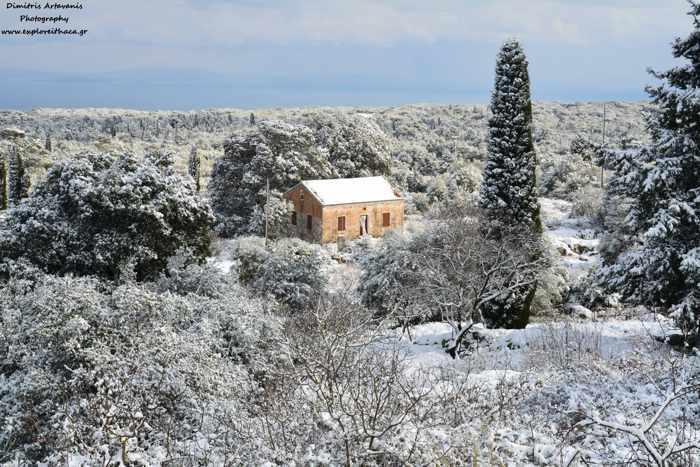 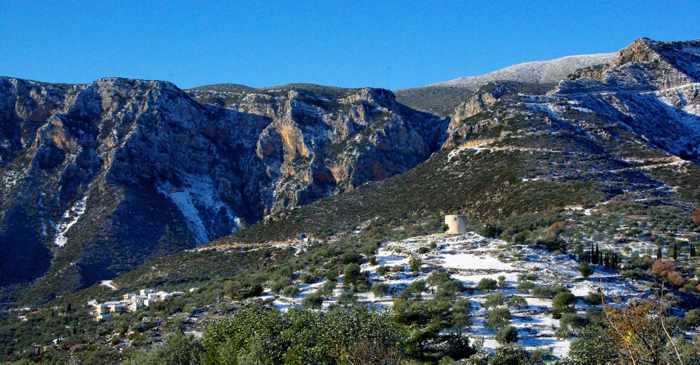 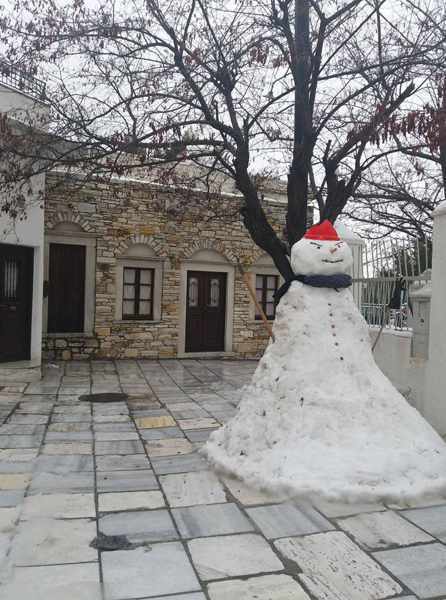 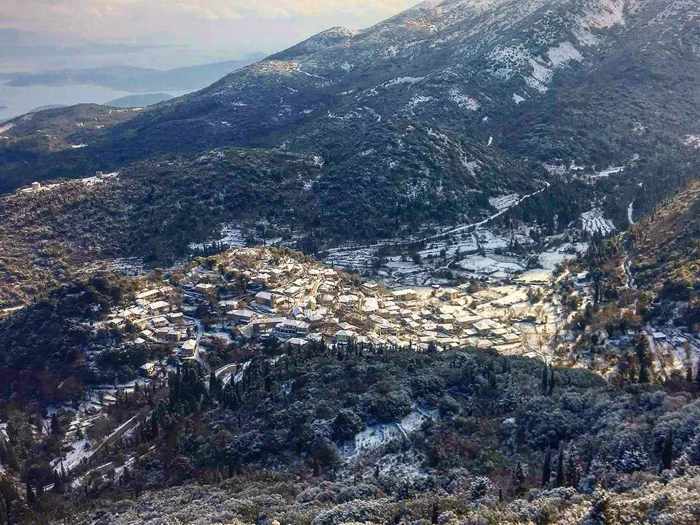 Winter scene from Thinia village on Kefalonia photo from the inkefalonia.gr news website. 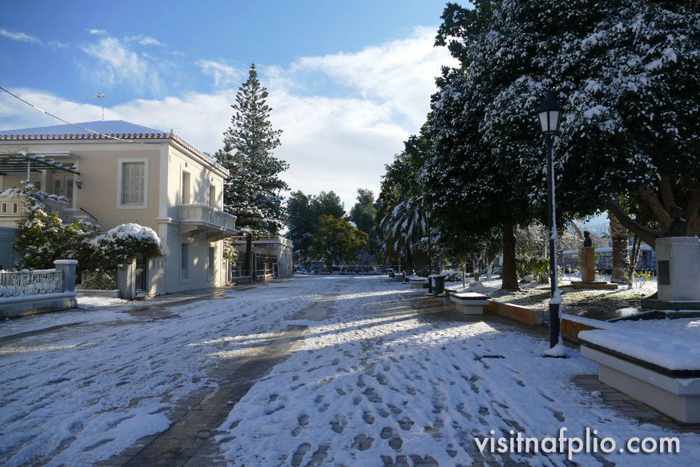 You can view more photos of the village and nearby areas in this photo set from inkefalonia. 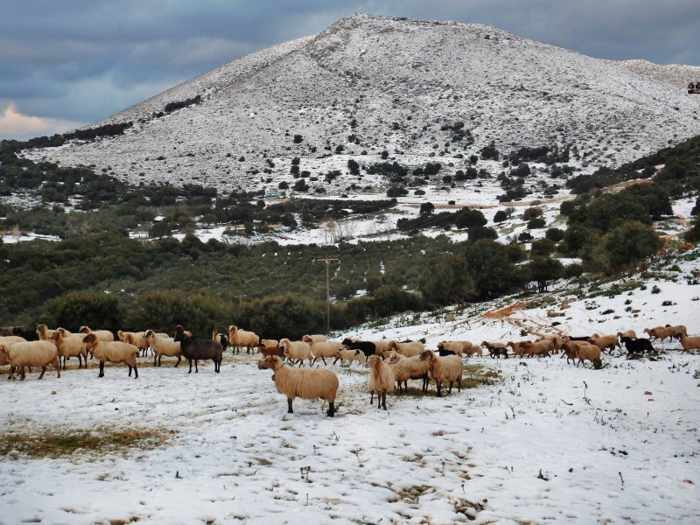 Sheep graze in the snow near Thinia village on Kefalonia. 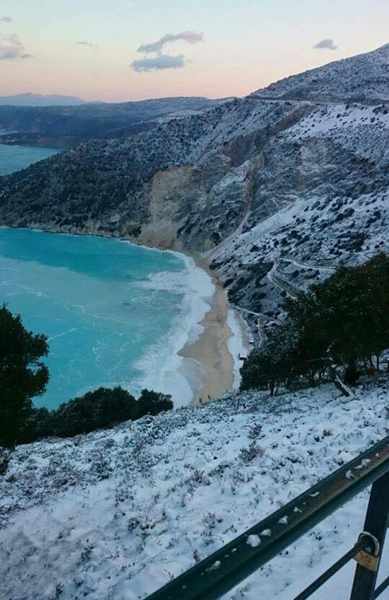 This is another photo from the inkefalonia.gr website. 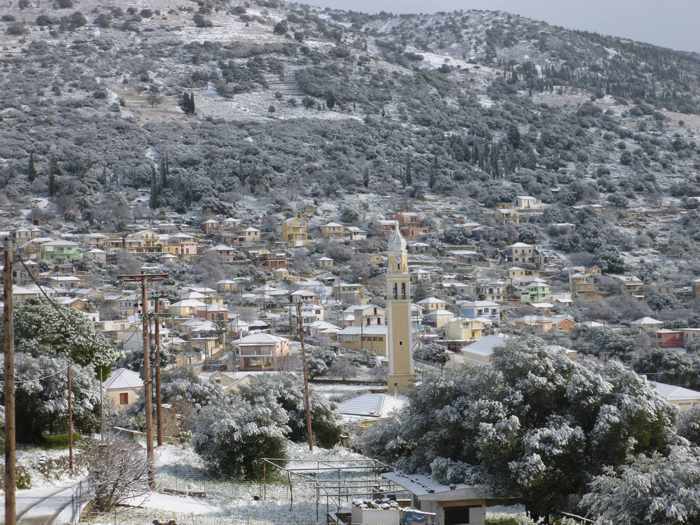 The media site Kefalonia Press published this photo of Farakiata village on Kefalonia on its Facebook page. 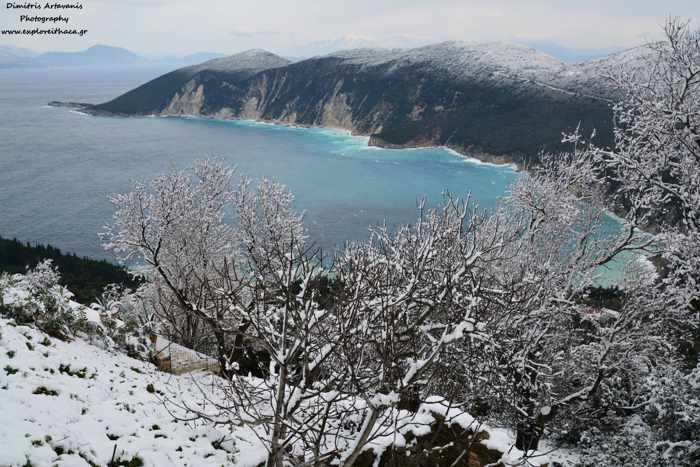 More photos can be seen in the Faraklata album that Kefalonia Press posted on Facebook. 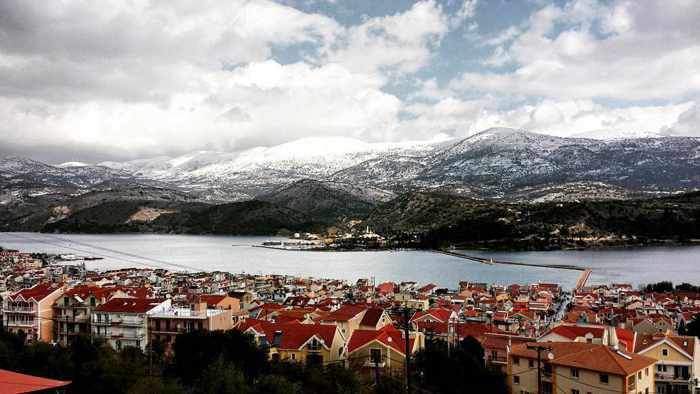 Argostoli village on Kefalonia is seen in an Instagram photo by Babis Tzortzatos. 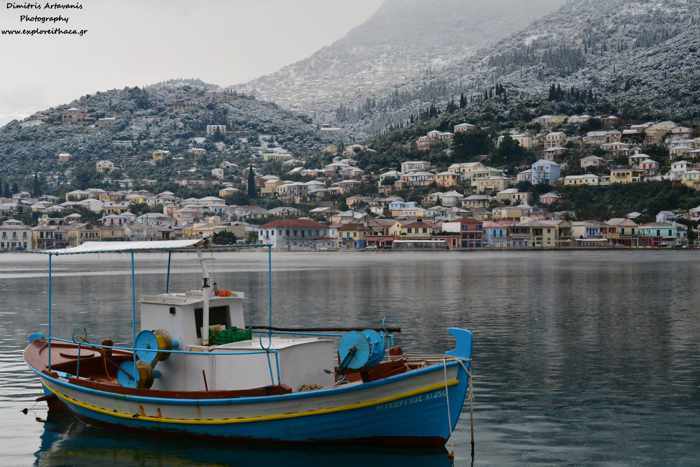 More Instagram photos from Kefalonia can be viewed in this gallery from the inkefalonia, as well as in this second set of pictures the website posted. 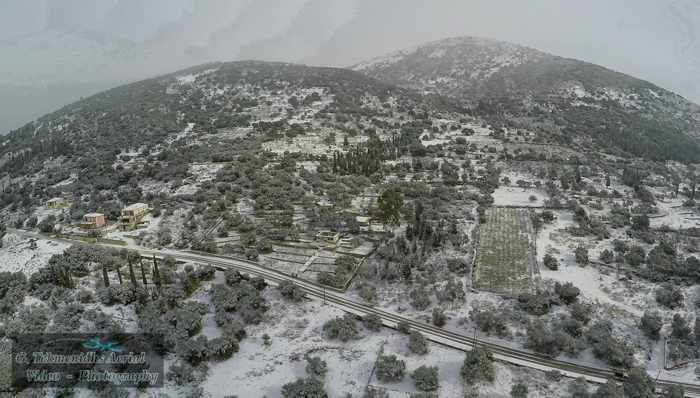 G. Tekmenidhs Aerial Video – Photography posted to its Facebook page this drone photo of Faraklata village on Kefalonia. 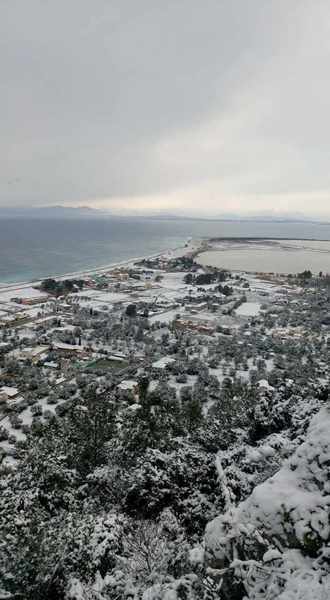 Additional aerial photos of the village can be seen on the firm’s Facebook page. 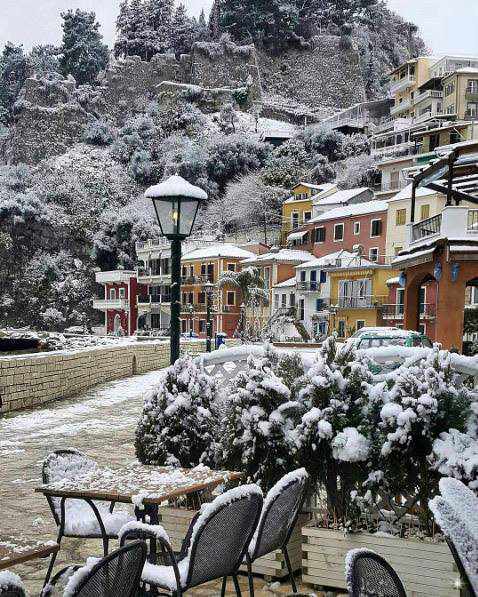 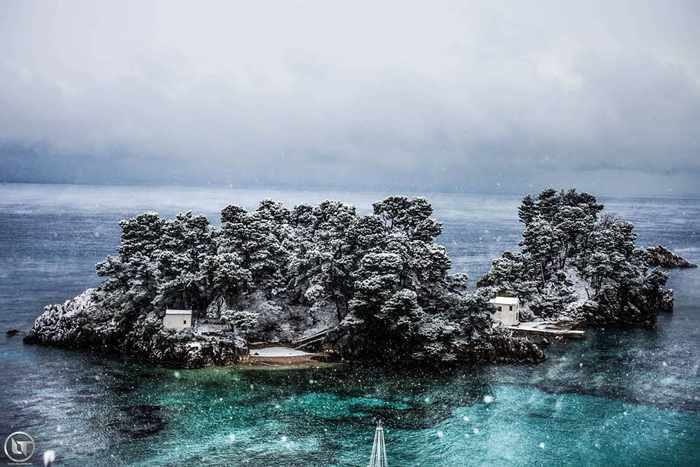 Dimitris Artavanis took this photo of Anogi village on Ithaca island on January 10. 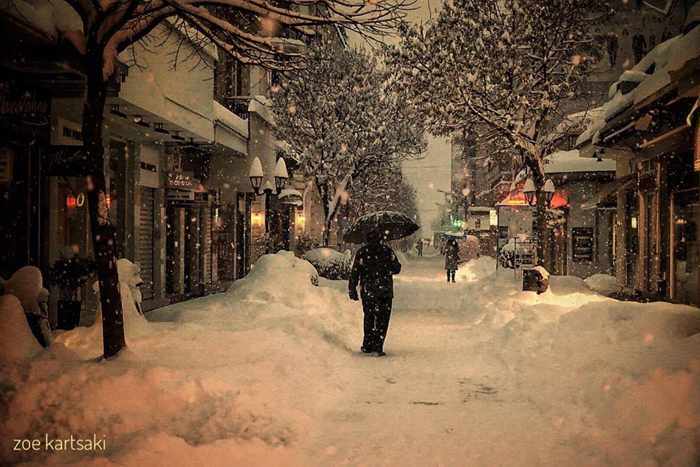 The photo was posted to the Explore Ithaca page on Facebook. 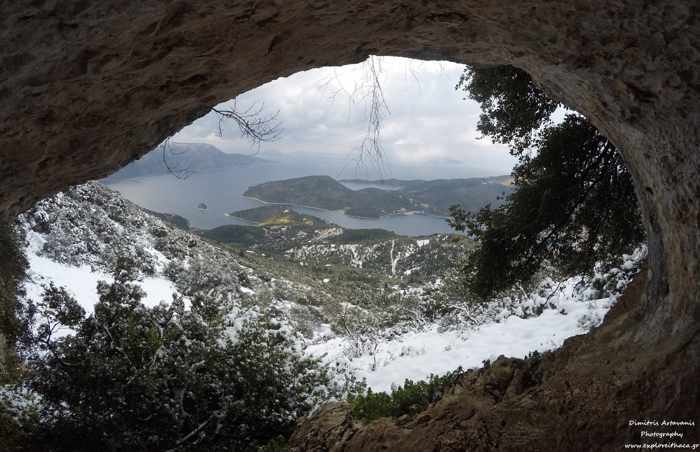 A scenic bay in the Exogi area of Ithaca island is seen in this January 10 image,by Dimitris Artavanis, that was posted to the Explore Ithaca page on Facebook. 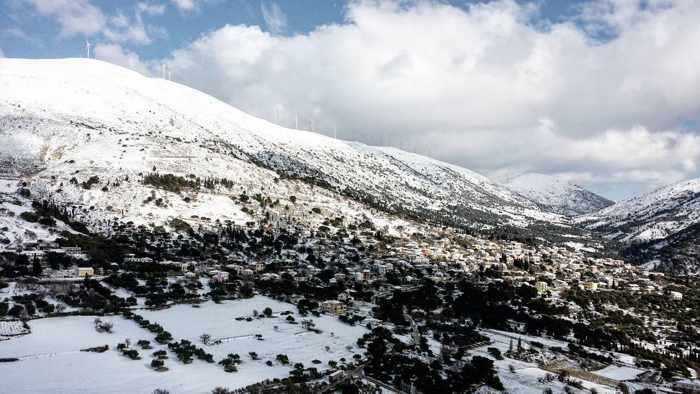 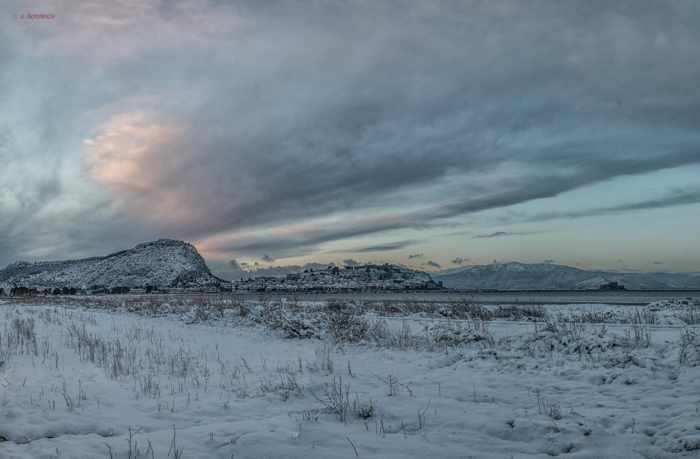 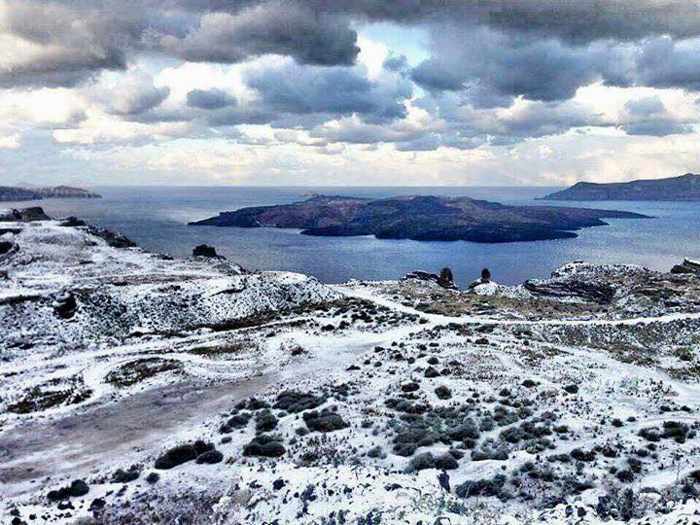 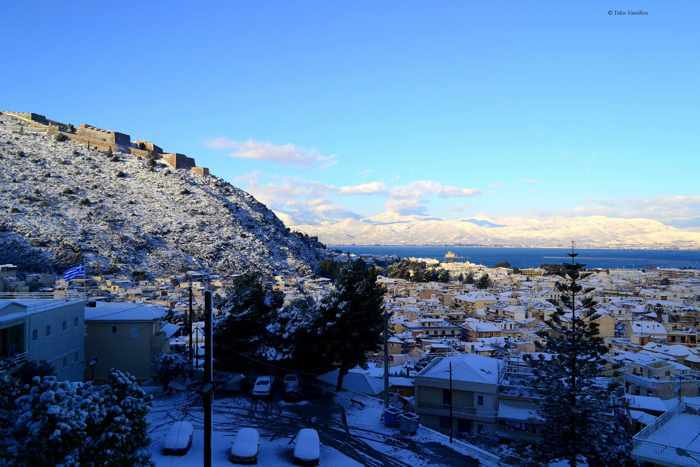 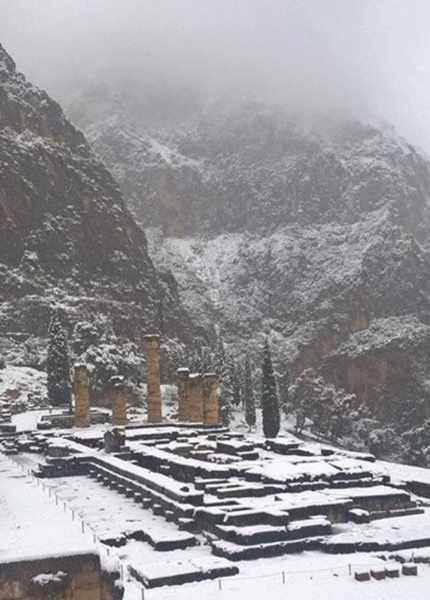 Thanos Komninos captured snowy Arctic-like landscapes in this dramatic photo showing the view toward the Palamidi mountain fortress (left) and the town of Nafplio (center) following an early January snowfall. 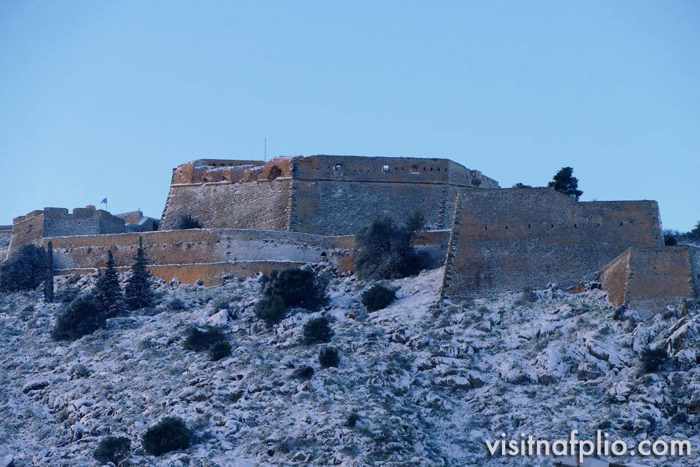 The photo was posted to the Nafplio Kalimera Facebook page. 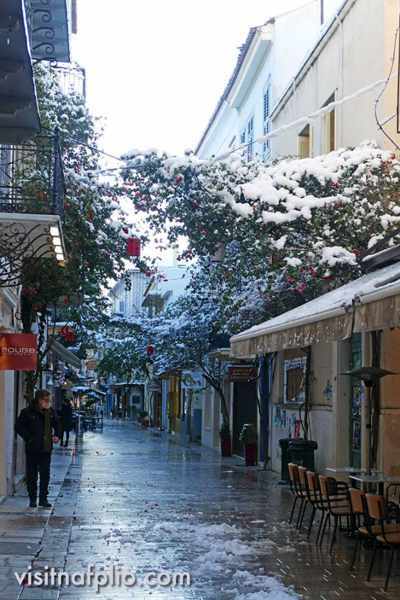 Νικόλαος Καμπίτσης photographed a long flight of snow-covered steps in the Nafplio Old Town. 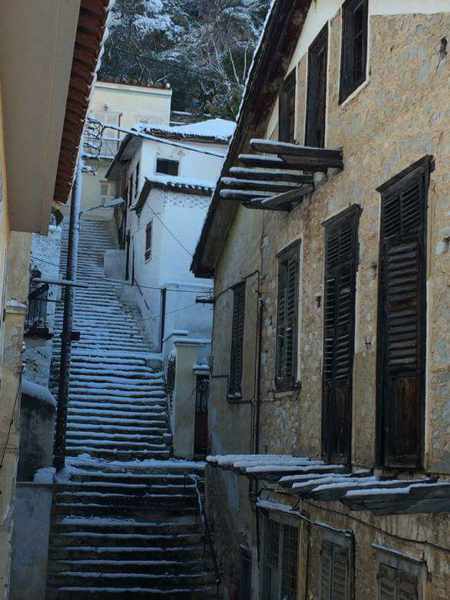 I have walked up and down those stairs in dry weather — I certainly wouldn’t want to risk climbing the steps when they’re slick with fresh snow or ice! 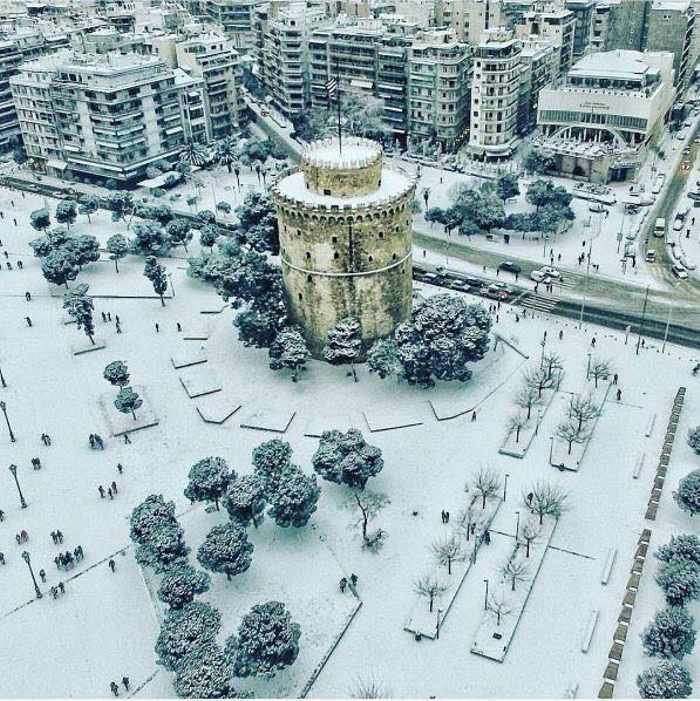 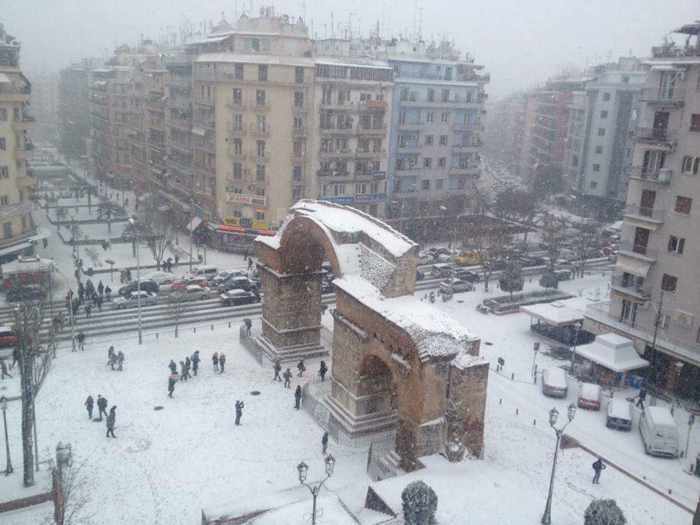 Snow surrounds the historic White Tower at Thessaloniki, seen in a photo from the Ich bin Grieche Facebook page. 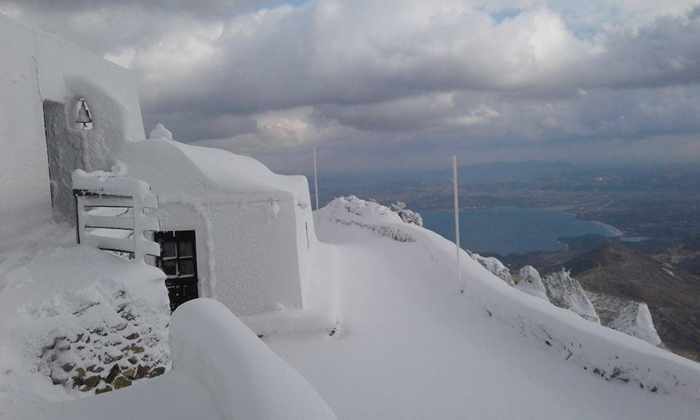 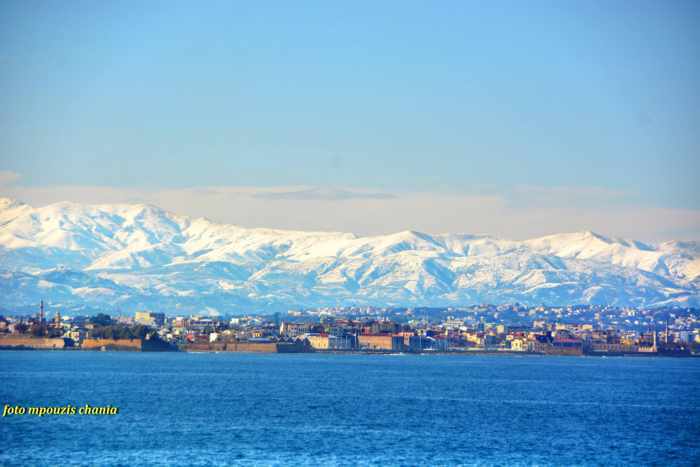 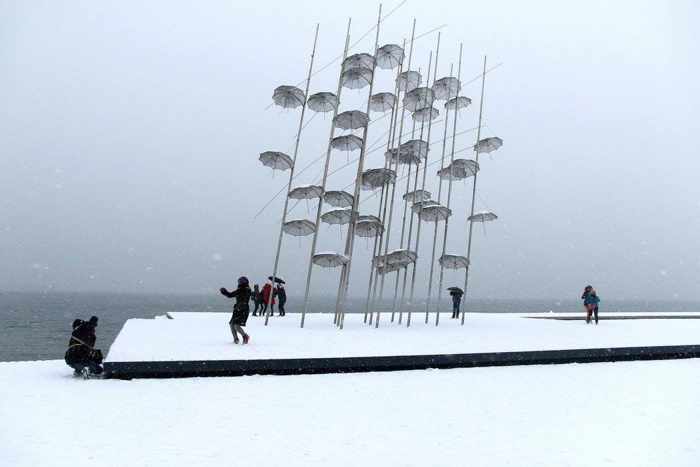 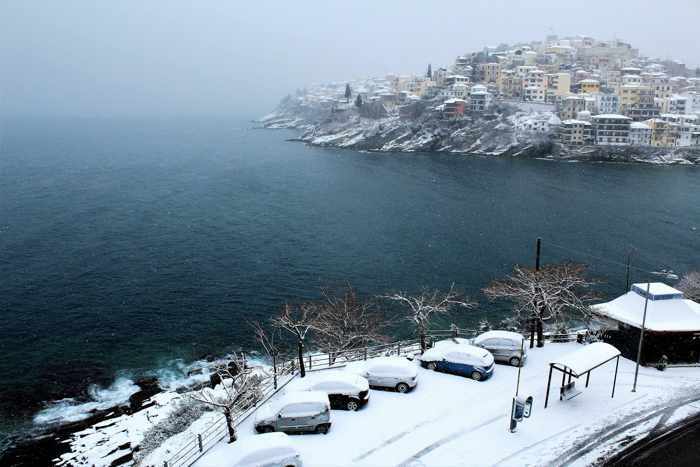 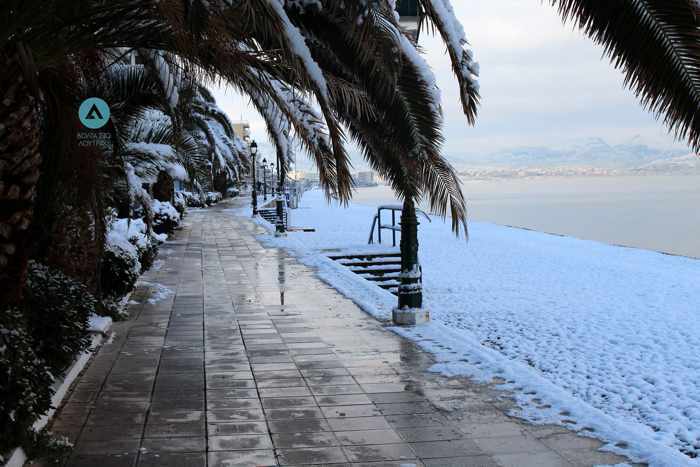 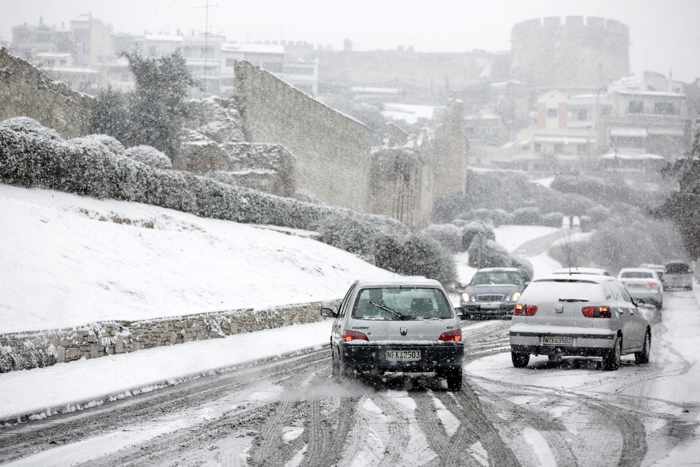 More winter scenes from Thessaloniki can be viewed in this photo gallery from the inkefalonia news website. 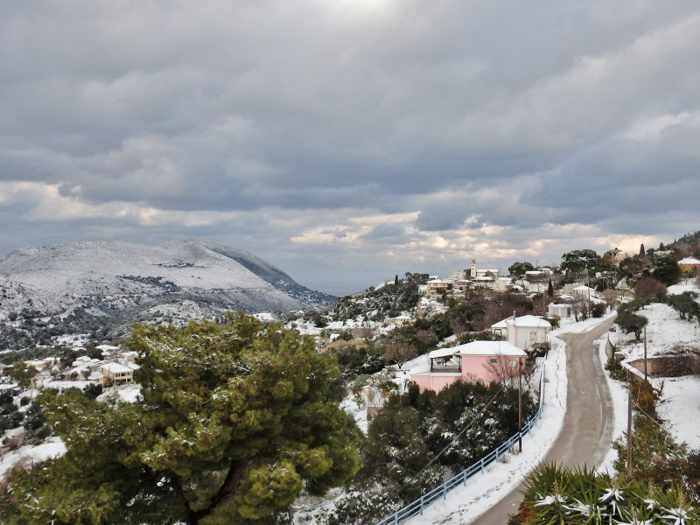 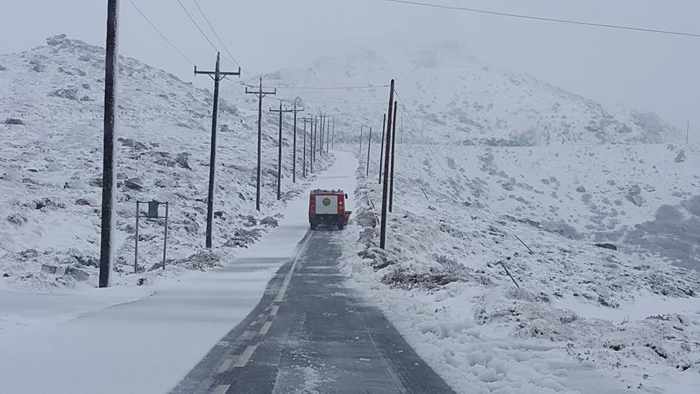 The entire landscape is shrouded in white as a snowplow clears a mountain road on Andros during a flurry. 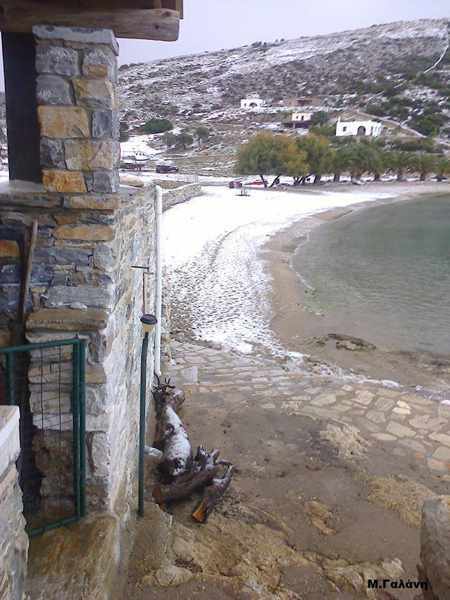 The photo is from the Andros Civil Protection page on Facebook. 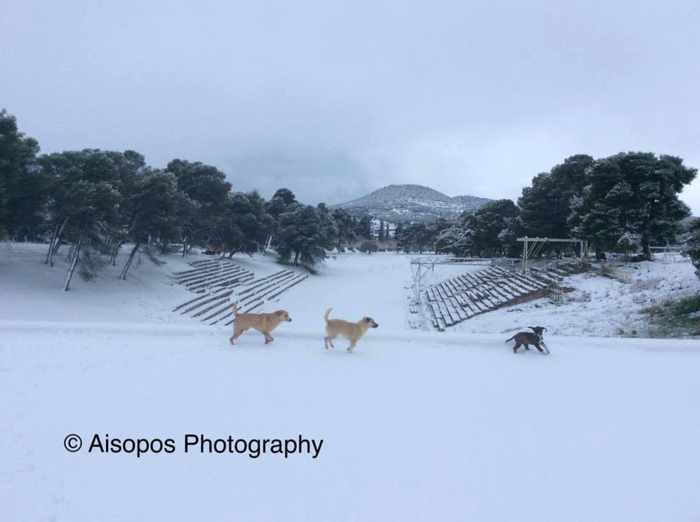 George Zampelis shot this photo on walking trail #1 on Sifnos. 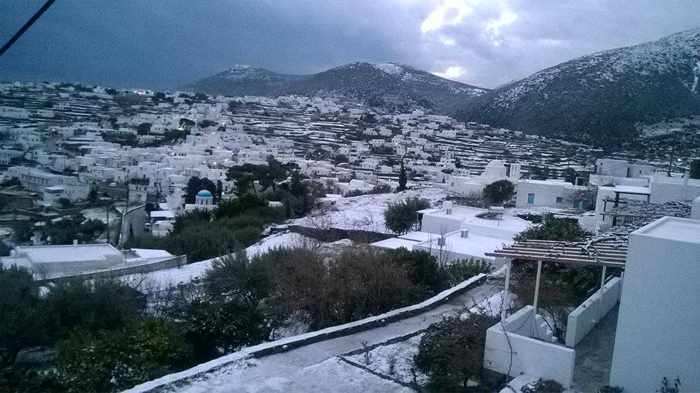 The image was shared on Facebook by Sifnos Trails. 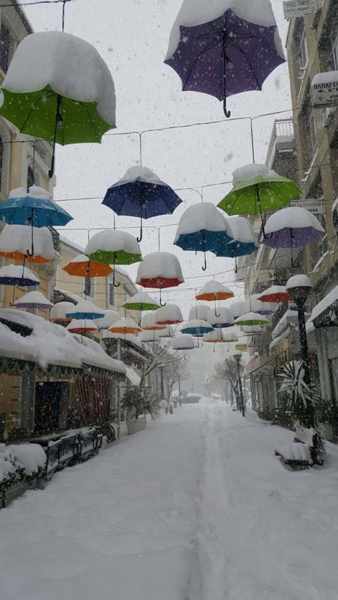 A photo by Marina Pappa of snow-topped umbrellas hanging above Palion Mastoron street in Karditsa. 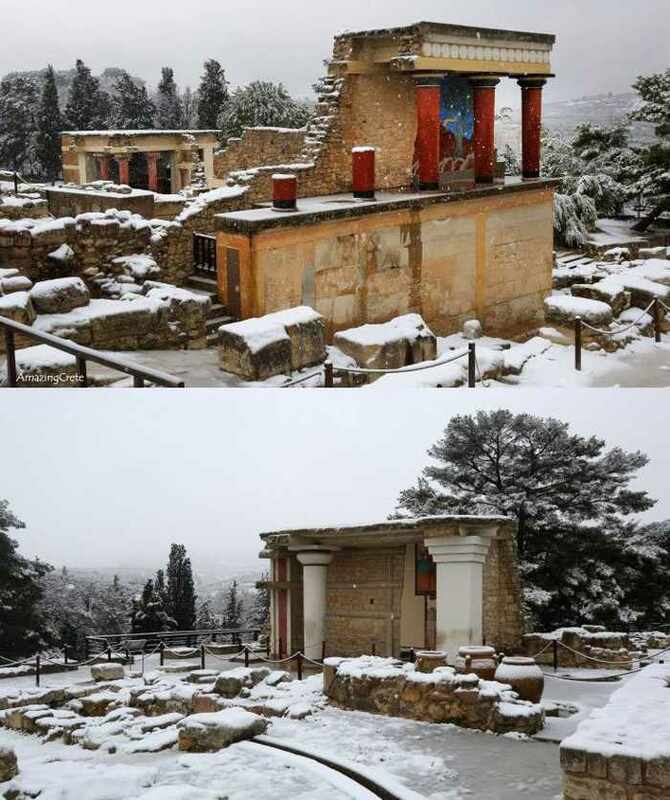 The image was shared on the Greeks Worldwide page on Facebook. 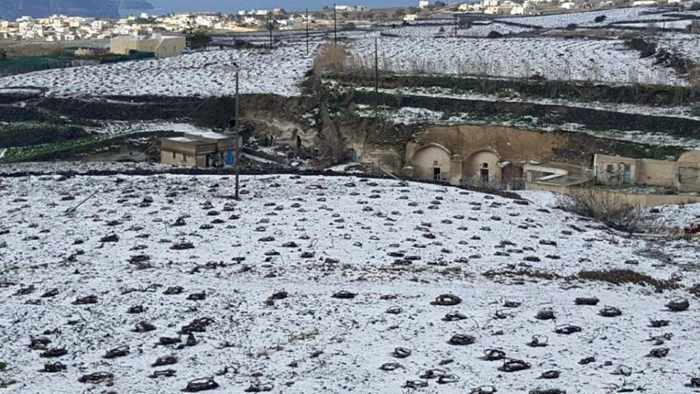 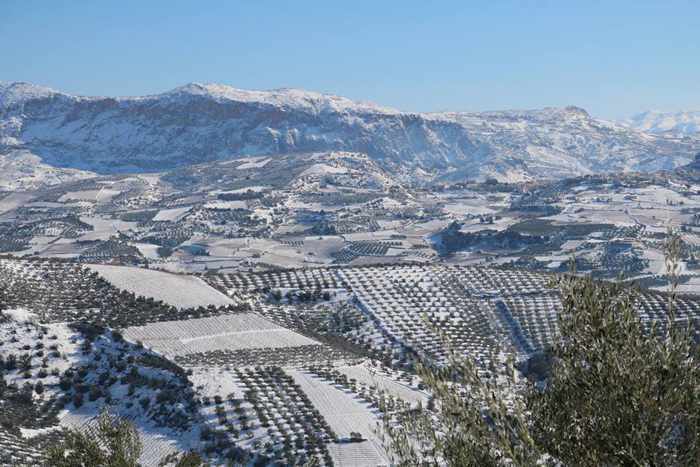 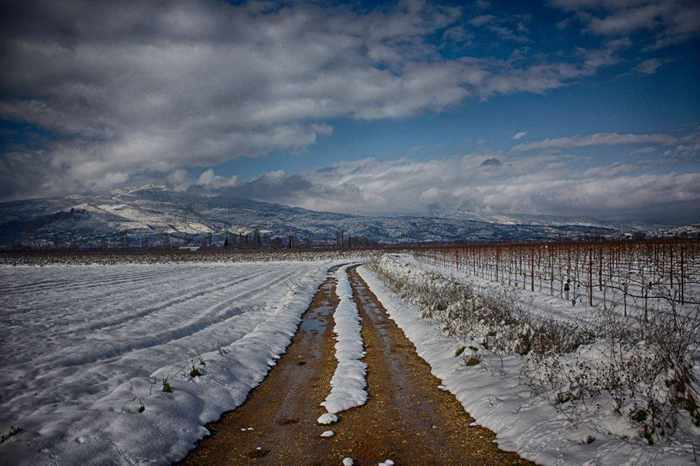 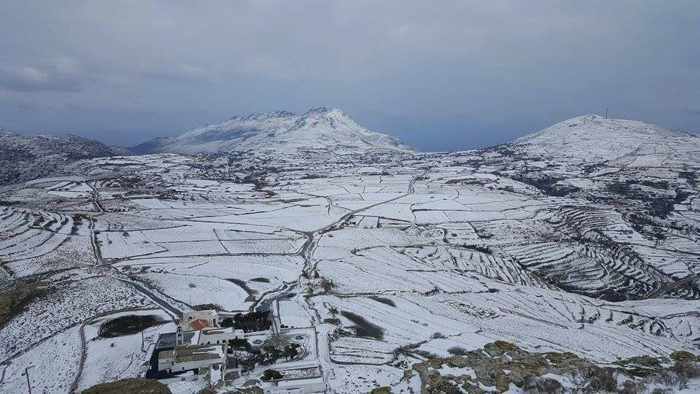 Christos Gastouniotis captured this image of snow-covered hills and vineyards in of snow in the Nemea wine region. 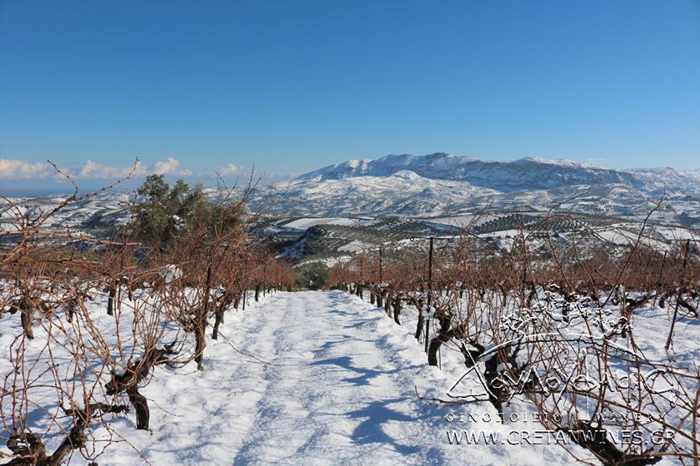 Check out the Wines of Greece Facebook page for more winter photos of vineyards throughout Greece.